AT a time when businesses are being encouraged more than ever to look to higher growth markets overseas, the launch of a raft of new routes from Scottish airports has come as welcome news. New services between Scotland and long haul destinations like Doha and Chicago have already begun with routes to Abu Dhabi and Halifax, Nova Scotia, planned for this year. Closer to home, additional links to short haul destinations like Dublin, Marrakech and Geneva have also been announced. According to David Robertson, consultant at Colpitts World Travel, the most significant recent development for business air travel has been the growth in direct Middle East routes to Scotland. “The two new services between Edinburgh and Abu Dhabi as well as Doha, along with the doubling of Emirates’ existing Glasgow to Dubai service, mean we will have over 8,600 seats going between Scotland and the Middle East a week from June. Robertson says American Airlines’ new summer service from Edinburgh to New York’s JFK in May will also enhance access to and from Scotland and North America. He believes a direct service from Scotland to the west coast of the USA would also be beneficial from both a business and leisure point of view. “But I suspect we’ll not see this in the short term,” he cautions. The potential value to the Scottish economy of the launch of new routes was highlighted by analysis by VisitScotland that the service launched between Doha and Edinburgh by Qatar Airways in 2014 will generate around £33m in economic benefit in its first year and some £86m within three years. The new service, operating from Edinburgh Airport, provides tourism and business customers with a hub connection flying to 136 destinations around the world. The spinoffs of better connectivity have also been highlighted by Turkish Airlines recently forming an alliance with the Scottish Chamber of Commerce to raise awareness of the opportunities from its Edinburgh to Istanbul route. Ahmet Serhat Sari, the Turkish Airlines’ general manager in Scotland, says the number of Scottish firms which have commercial relationships with Turkey is increasingly rapidly. 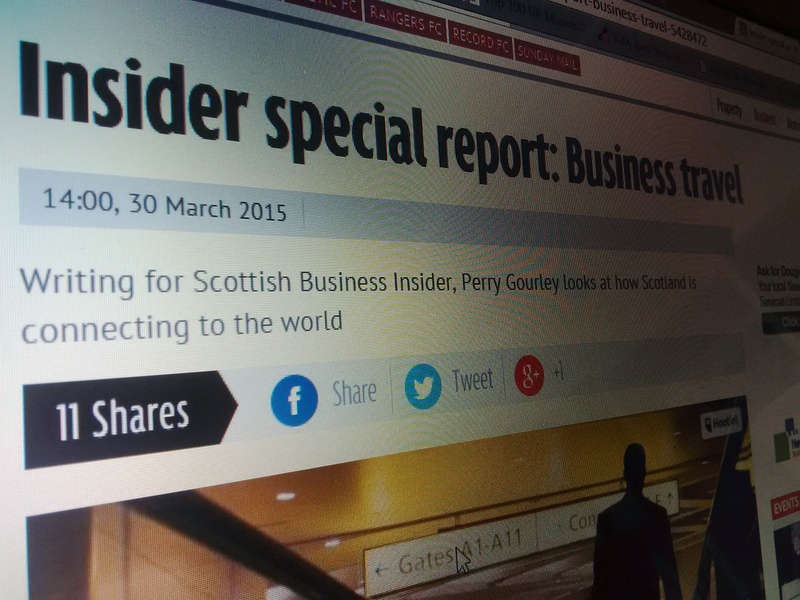 “Turkey is fast becoming an important strategic hub for Scottish businesses,” he argues. “The oil and gas industry is the biggest sector in Scotland, which continues to drive passengers to Baku, Kuwait, Tbilisi, Saudi Arabia, Iraq, Iran and Lagos. On the domestic routes front, Ryanair launched a new base at Glasgow Airport in October with three daily flights to Stansted and Dublin aimed at business travellers. Although new routes have provided Scottish businesses with greater options than ever, looking at ways to minimise business travel costs continues to be high on the agenda for companies. Airline pricing was named the top concern for business travel buyers for 2015, according to a recent sector survey. Paul Reid, business development manager, at Barrhead Travel, argues a good company travel policy is an important foundation to better control costs. Analysis of data and travel behaviour is also becoming increasingly important in the drive to minimise expenditure. “Reports can be produced showing what proportion of travel is booked in advance and how far in advance and we can benchmark that against other companies,” says Reid. Graeme Milne, general manager of Corporate Traveller, says the increasingly long-haul nature of business travel also demands more support. “More and more businesses are operating in the broader global market and greater distance means more potential for travel delays caused by missed connections, inclement weather or service disruptions,” he says. “Business trips for some executives are also getting longer as companies try to gain maximum return on investment from each journey. “Instead of point to point, business trips are often taking in multiple countries. Franc Jeffrey, chief executive of EQ Travel Management, says business travel buyers needed to look beyond financial considerations. “Businesses should be making travel plans that are based around what the executive or company want to achieve from the trip, and understand important contracts can be lost as a result of staff arriving fatigued,” he says. The train appears to be an increasingly attractive option for domestic business travellers. Journey times from Glasgow and Edinburgh to London are reducing and frequency of service increasing. The award of the East Coast franchise to Stagecoach and Virgin Rail will see increased investment. Regular four-hour services from Edinburgh to London will increase and a 50 per cent rise in capacity is promised by 2020 with total fleet capacity increased by 12,200 seats. Virgin Trains has also reported a surge in cross-border rail travel following investment in additional seating capacity. The West Coast Main Line operator says passenger numbers on its Anglo-Scottish services rose by 11 per cent last year after it made an additional 3,000 seats available every weekday. A new Caledonian Sleeper service will also operate between Scotland and London from April with operator Serco promising improved hospitality and accommodation and hotel supplies. An investment of over £100m will see 75 new state-of-the-art carriages enter service from 2018.